Slags may be flame sprayed to produce hollow vitreous or semi-crystalline microspheres. hollow spheres is also discussed. 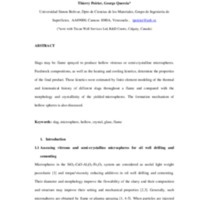 Thierry Poirier, George Quercia, “Formation of hollow vitreous and semi-crystalline microspheres in slag flame spraying,” esopo.usb.ve, consulta 24 de abril de 2019, http://esopo.usb.ve/items/show/54.